The Sovereign was first introduced in 1489. So named because it featured an image of the King on its obverse. Today The Royal Mint regularly strikes Gold Sovereigns for collectors in a high standard of striking called ‘Proof’ quality. I was given the challenge of tempting lapsed Sovereign purchasers ‘back into the fold’ to buy coins of the 2014 Collection, all struck in 22 carat gold. The medium was Direct Mail. United Kingdom Sovereigns are widely regarded as being among the most beautiful coins in the world. Since 1816 they have featured the beautiful depiction of St George and the Dragon by the Italian engraver Benedetto Pistrucci. 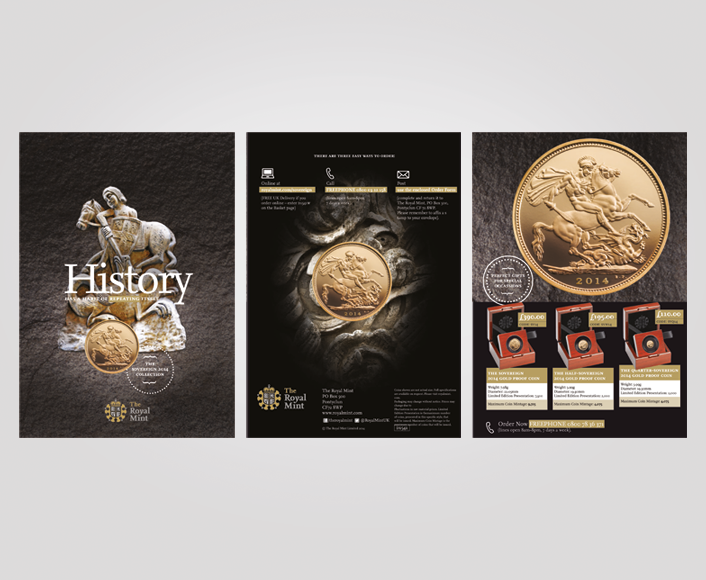 The Royal Mint first introduced limited edition Proof quality Gold Sovereigns to collectors in 1979. The mailing piece is designed around the concept of ‘History Repeating Itself’. 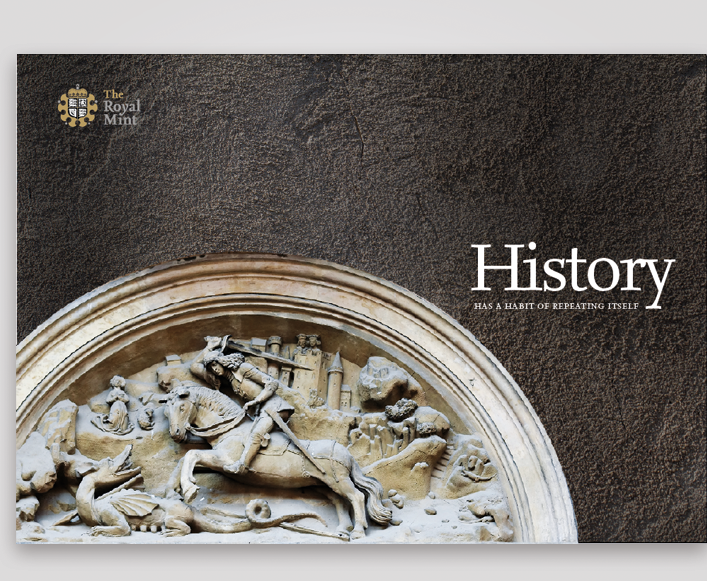 It outlines the story of St George and the Dragon and shows examples of other historic medals, seals and sculptures that have borne the famous image. 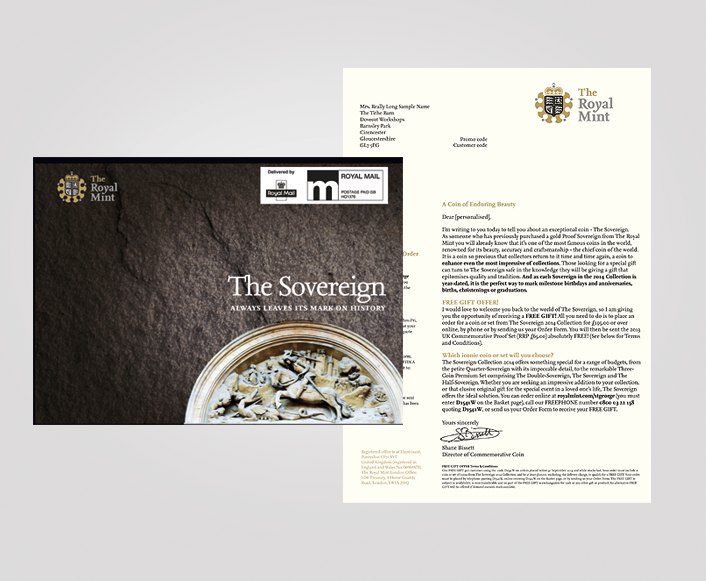 The Sovereign’s history is supported by many images from the Mint’s archives, coupled with others which I curated from independent picture libraries. The mailing achieved an 87% success rate.